If you aren’t familiar with Chase Bliss Audio their unique pedal designs add unprecedented digital control to original and creative analog circuits. 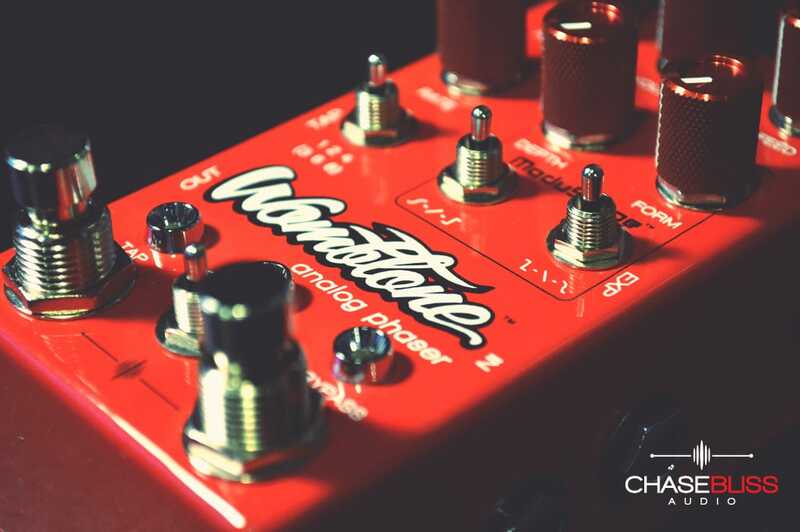 Coupled with a vast array of parameters these pedals are very versatile and aimed at guitarists who want something truly different from their stompbox. Their first product, The Warped Vinyl has been a huge success and guitarists all over have been trying to get their hands on one. Capable of ooey-gooey chorus/vibrato and nostalgic tones, we were very excited when we heard about Chase Bliss’ next release. 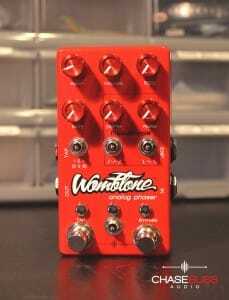 The Wombtone Phaser boats warm, thick, lush and atmospheric analog sounds in housing packed with parameters and endless capabilities. OVERVIEW: Do you remember the womb? 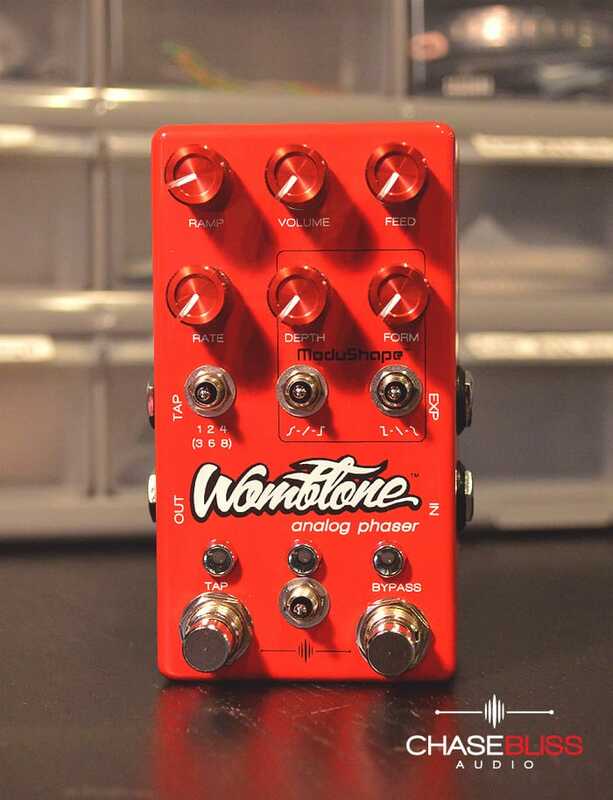 I imagine this pedal feels like that experience… warm, thick, lush, atmospheric, analog, fluid… you know, womb-like. In short, it’s a super rad phaser. This pedal features an analog signal path, but every knob is connected to a little digital brain (aka microprocessor) that interfaces with the analog effect. Your guitar signal stays analog the entire time and never gets digitally processed. Since the control of the effect is digital, it opens up unprecedented effects that have never been heard in an analog stompbox. RAMP: Simply put, this is a magical knob. Due to the digital control of this pedal, you can set this knob to control any of the five parameters individually or simultaneously (volume, feed, rate, depth, form) and have it either modulate or ramp-and-hold (rise or fall) via dip switches in the back of the pedal. Essentially, this knob controls the ramp time in which this takes place. You can even make a tremolo effect by choosing to modulate the volume knob. VOLUME: Sets the level of the effect. This pedal has lots of boost and headroom on tap (I use a voltage doubling device in the pedal to get to 18V on the boost circuitry), and, of course, the ramp knob or an expression pedal can control this knob. So hey, it could be a volume pedal too; in fact, the elements used for this are the same as audiophile-grade attenuators used in hi-fi set ups. FEED: This controls the amount of feedback on the phasing effect. All the way clockwise is extreme, while counter-clockwise gives a more subtle effect. RATE: This controls the rate of the phasing effect. This control can be over-ridden by the tap tempo switch. you access the “3 – 6 – 8” divisions if you so desire. DEPTH: This controls how wide the phaser goes. Vocal tones can be found somewhere around 11 o’clock. FORM: This controls the center point of the modulation. Crank it to counterclockwise, the wave is going to ramp up quickly and ramp down gradually. If you crank it clockwise, the wave will ramp up gradually and ramp down quickly. If this knob is straight up and down at 12:00 it will give a perfectly symmetric wave. Left Wave Shape Toggle: This controls the shape of the first half of the wave modulation. Left for sine, middle for triangle, and right for square. Right Wave Shape Toggle: This controls the shape of the second half of the wave modulation. Left for square, middle for triangle, and right for sine. The depth, warp, and wave shape toggles comprise the ModuShapeTM engine, which give unprecedented control over the shape of your modulation. Bypass Stomp: Activates or bypasses the effect. This can be changed to a momentary bypass via a dip switch in the back of the pedal if it is desired. This pedal is “True Bypass” via a relay, and is extremely quiet. Tap Stomp: Sets tap tempo, always honors the last two stomps. seconds and then hold down both stomp switches simultaneously for another 3 seconds. The LED blinks and your setting is saved. For the left slot, you do the same thing but hold the left stomp (tap) first. IN: 1⁄4” mono input jack. OUT: 1⁄4” mono output jack. EXP: 1⁄4” TRS jack for expression pedal (parameter selectable via dip switch in the back of the pedal. Tip goes to wiper, and we recommend Mission expression pedals (EP-1 or EP-25k). Can also be used to for 0-5V CV control on tip – the ring should be left floating in this case. TAP: 1⁄4” TRS jack. This can be used as a tap input or output with a regular 1⁄4” instrument cable. If you use our midi adapter TRS cable, you can interface this pedal with an empress effects midibox and sync to a midi clock, recall presets, activate/bypass the effect, or reset the ramp. Wombtone lives on midi channel 6. We’ve also been working with Disaster Area Designs to interface directly with their controllers. Email me for more info. Power & Other Info: This pedal consumes ~50mA and should be operated with an alkaline 9V battery or a standard 2.1mm 9V DC center negative adapter. We recommend Voodoo Labs Pedal Power. Input impedance of this device is 500k, and output impedance is 1k. Below is a diagram and explanation of all the dip switches. When you save a preset, all of this information gets saved. 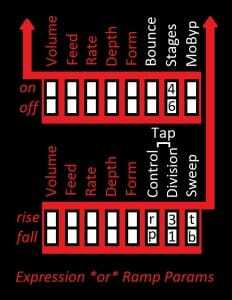 The parameters in red below correspond to the ramp function *or* an expression pedal (if one is plugged in). If an expression pedal is plugged, ramp functionality is disability (c’mon, you can do your own ramping). Ramping always gets reset when bypassing. The parameters’ current knob position control where the parameters ultimately will stop ramping. The Volume, Feed, Rate, Depth, and Form dip switches on the left side simply turn that parameter on or off for ramping or expression pedal capability. 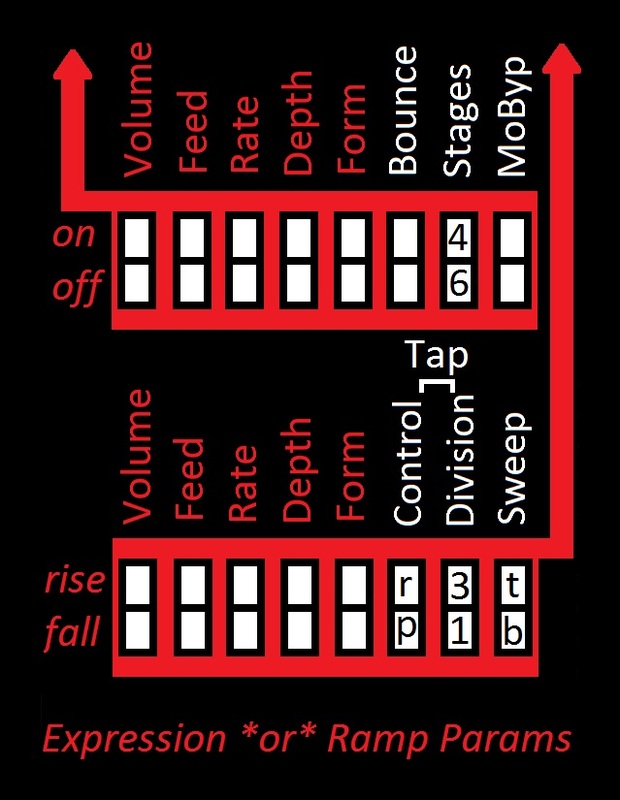 Volume, Feed, Rate, Depth, and Form dip switches on the right side control whether or not the parameters will rise (go clockwise in ramp mode) or fall (go counterclockwise in ramp mode). It also controls how the parameters will behave with an expression pedal plugged in. with bypass stomp pressed in. Tap Control: “r” stands for ramp, “p” for phaser and is default (rate control). This allows the user to tap in the speed for ramping rather than RATE. Great for modulating parameters. Bounce needs to be on in this case. Tap Division: In position “3” allows for 3, 6, 8 tap divisions. Sweep: this controls where ramp sweeps. In “t” (top) the ramping (or expression control) will occur between the current knob position and the max position (fully clockwise). In “b” (bottom) the ramping (or expression control) will occur between the current knob position and the minimum position (fully counterclockwise).